Czech Military Surplus Aluminum Mess Kit | BUDK.com - Knives & Swords At The Lowest Prices! We've found a new stash of quality military surplus goods and we're passing along the unheard-of savings to you with our rock-bottom pricing! 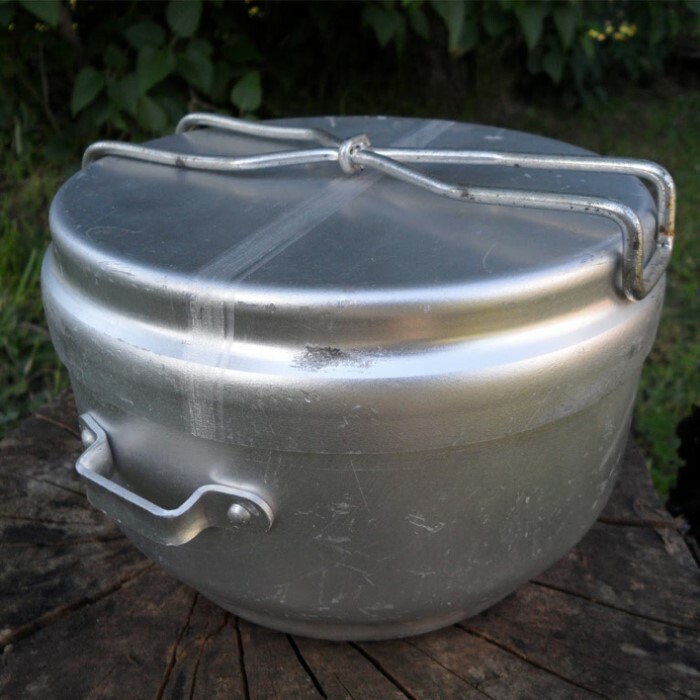 This aluminum Czech military surplus mess kit will come in handy if you find yourself having to rough it for a while. 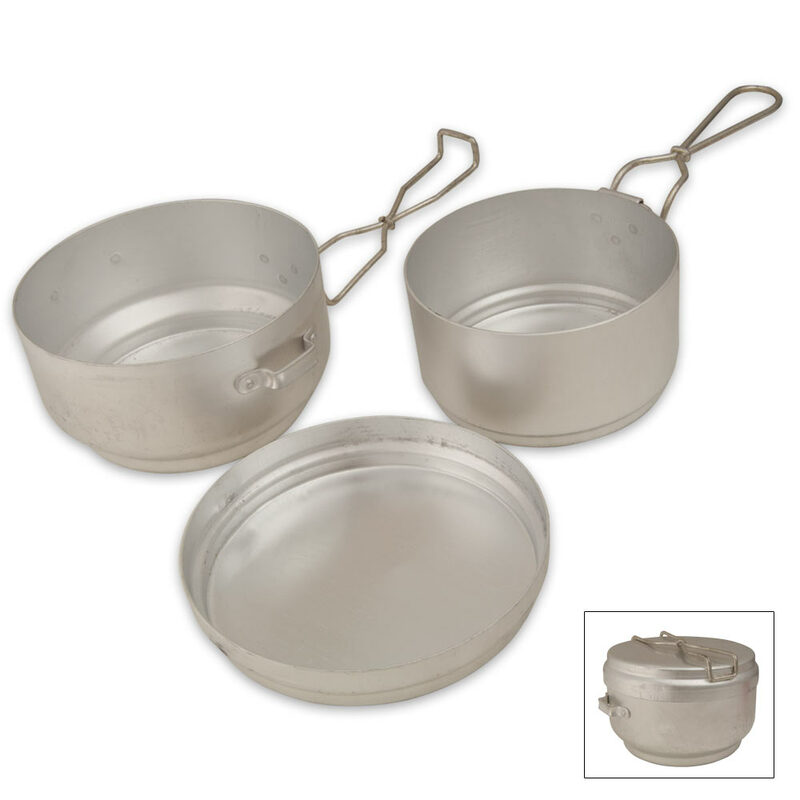 The aluminum construction is durable but lightweight, and the pieces nestle together, making this military surplus mess kit a breeze to transport. The two pots feature sturdy fold-away handles that won't get hot while you're cooking and one lid to service both pots. 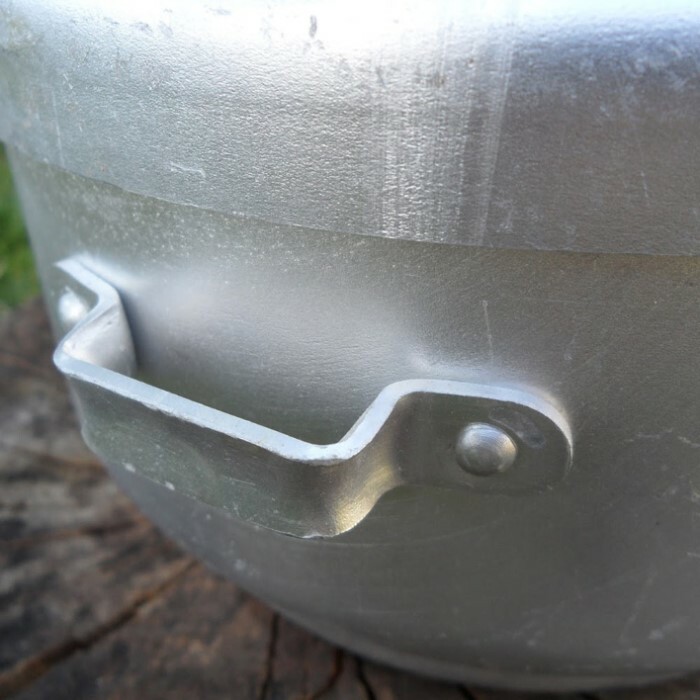 This mess kit is ideal for camping, outdoors and extreme survival. It comes to you in used but like new condition. Previous owner of Czech military mess kit I'd just rcv'd, must've taken really good care of it. This one came looking identical to the shiny pic's, as shown. Impressively well made, an excellent surplus purchase. Nicely surprised, very pleased with this. Another reviewer mentioned his pot blackened over a fire. Just rub a small bar of soap on the sides and bottom, and cleanup is easy. Mine came with used, but very clean. Not bad for the price . Mine didn't have the side handle on it like the one shown .Smaller then I thought it would be(6inches across 4 inches deep lid 1 inch deep ) but still nice .Will be great to stick in backpack so you have some thing to use for cooking . If your looking for something small for a survival pack this would be perfect .Satisfied ,would recommend . This is my favorite mess kit. The pots with fold out handles are the perfect size for a 1 or 2 person meal. Sturdy construction. No frills, really, just a good, solid, practical kit. You might get a lighter weight camping kit, but they tend to be thin making easy to burn the food. These are just right. $10 is a good price, too. If you're going to be hiking or camping, this is just the ticket. Will work equally well on stoves as over fires. I even use mine in the kitchen when I need a small pan for the gravy or whatever. The big one will handle a can of soup, beans or vegetables. They just don't come any better! These mess kits are in almost perfect condition and they work well for bowls in my backpack. This item is pretty good, the smaller pot fits into the larger pot before being closed in by the "plate" top. You can still store some items into the small pot before closing everything up. The only down side is that when I used it over a campfire the outside of the pot turned black and I couldn't get it off. It doesn't bother me, but it could bother other people who purchased it.